It’s no secret Ricky Wysocki has been a dominant force on the course over the last two seasons. Yesterday at the Ed Headrick Disc Golf Hall of Fame Classic, though, he unleashed havoc during the most unexpected moment: a backup. 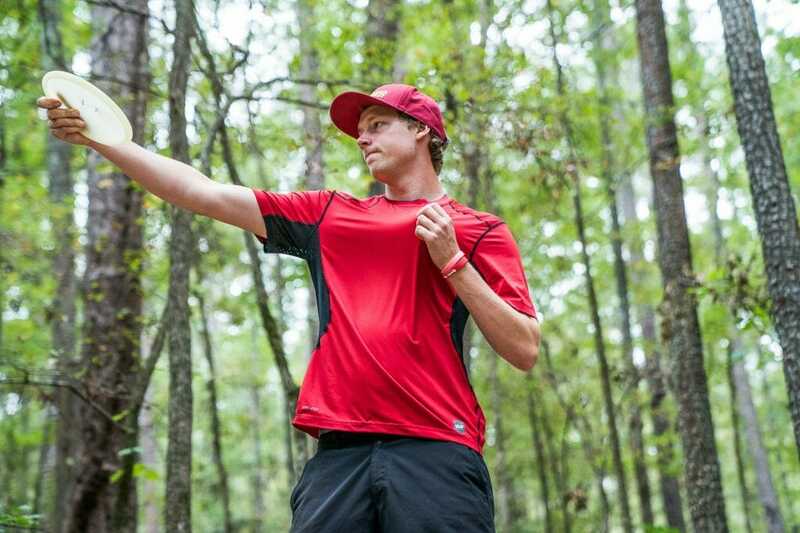 A three-card logjam on hole 8 of the International Disc Golf Center’s W.R. Jackson Memorial Course brought Wysocki and his fellow chase card competitors to a halt. As Devan Owens, Zach Melton, and Austin Turner passed the time by “chunking pine cones at each other,” as Turner described it, the trio was surprised to see the normally stoic Wysocki jump in on the game. Give athletes possible projectiles, and the hijinks amp up quickly. Owens, of course, was given a chance to return the favor. But he failed to bring the pain. “I wiffle-balled it right past him,” Owens said. 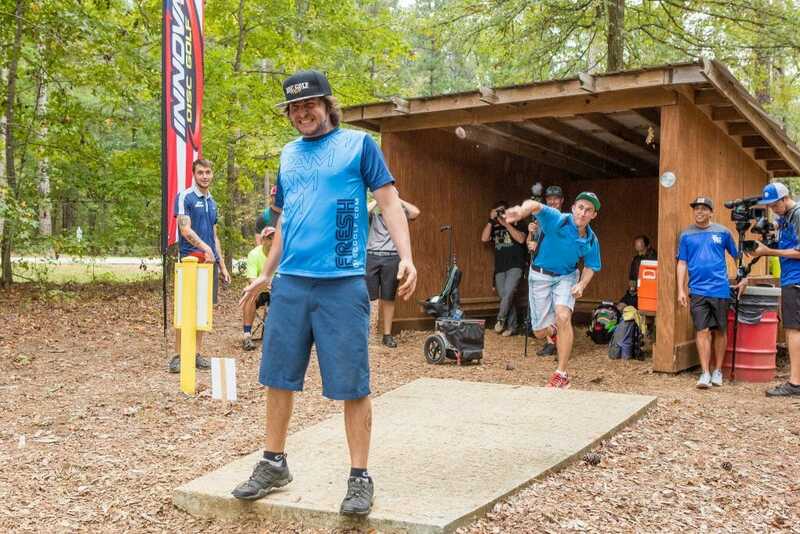 The sequence captured a rare moment of levity from Wysocki, as the two-time PDGA World Champion usually spends his time between holes in solitude. Instead, he took a chance to bask in the twilight of the 2017 season and enjoy being a big kid, just out playing in the forest with his friends. And it translated on the scorecard, too: Wysocki, Owens, and Turner all threw 9-under par 59s, elevating them to the top of the field with 22-under par 110s along with James Conrad, whose 6-under par 62 kept him tied for the lead. Simon Lizotte’s 11-under par 57 qualified as the hot round and found him climbing from 18th place to fifth, which he shares with Chris Dickerson, who also joined the 9-under par club yesterday. The pair are only one shot off the lead with their 21-under par 111 totals. Wysocki started off the round quickly yesterday, carding a turkey to open play. He went 4-under par through the front nine, then saved his second most aggressive play of the day for the 837-foot 10th. And attack he did, rolling a Latitude 64 Vision to 20 feet for an easy eagle on the par 5. Not as much as was gathered by Owens, though. The Oklahoma lefty was the only one on his card to notch birdies on the short run of par 3s that make up holes 11 through 13. And while Wysocki’s finish was spurred by his strong play on 10, Owens said his own misplay for a par on that hole made him frustrated enough to snap into action. He didn’t necessarily want that style to spill over into today’s round, though, and he said he’s been working more recently to keep his feelings in check. That would go a long way toward giving him his first NT victory since the 2011 King of the Lake. Turner, meanwhile, has gone bogey-free through the first two rounds of the tournament. He came close to going over par after a poor second shot on hole 5 and a drive that cut-rolled out-of-bounds on 13, but he connected on saves for both from beyond the arc. He was also happy to see Wysocki take his light-hearted approach to the round, even if it meant some good-natured ribbing after the fact. Speaking of fun, Lizotte has made it well-known that he’s had trouble finding it through the end of the season. And even after a scorching round that featured a run of eight straight birdies to close play, he still wasn’t sure if his passion had been reignited. But taking home a first place trophy could help. “I don’t think it would change what I am feeling right now, but of course winning it would be awesome,” Lizotte said. “I still like winning. It’ll make me go to the offseason with a lot better feeling, of course. Even those beyond sixth place are still within striking distance. Zach Melton and A.J. Risley are tied for seventh place with 19-under par 113s, as Risley held his own with a 5-under par birthday round on the lead card. Paul McBeth rebounded from his first sub-1000 round in more than a year, using his own hole 10 eagle and a 1042-rated 9-under par to jump from a 26th place tie to ninth. He is knotted up with Michael Johansen at an 18-under par 114. It’s safe to say, then, that competitors may be more focused today, even if there are more delays. Turner, though, was aiming to keep it loose. 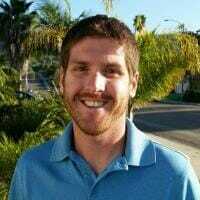 He’s had plenty of big-game experience in his young career, taking victories over disc golf luminaries like Ken Climo and Barry Schultz, and his season has been trending toward a signature win. Correction: A prior version of this article stated that Owens was going for his first career NT victory. We regret the error. Comments on "‘Fun’ Day Ends With Four-Way Tie Atop HOFC Leaderboard"